Lockport City Hall is located at 222 East 9th Street, Lockport, IL 60441; phone: 815-838-0549. Photo: The I & M Canal looking northwards, showing the 9th Street Highway bridge in the background. Historic American Engineering Record [HAER IL-16-A], Jet Lowe, photographer, 1979, memory.loc.gov, accessed June, 2012. The Village of Lockport was platted by the Commissioners for the Illinois and Michigan Canal in 1836 at which time land between 8th and 10th Streets and Commerce Street and the Canal was set aside as a Public Landing area. The canal served as a major means of communication and transportation for areas southwest of Chicago throughout the second half of the nineteenth century. Primary goods moved along the canal included grain and flour, and limestone from the quarries in the Des Plaines River Valley. Other products included timber shipped in from the north, and agricultural products such as sugar and coffee from the south. Passenger service was also important in the canal's early years, until it was superseded by the Railroads in the late 1850s. 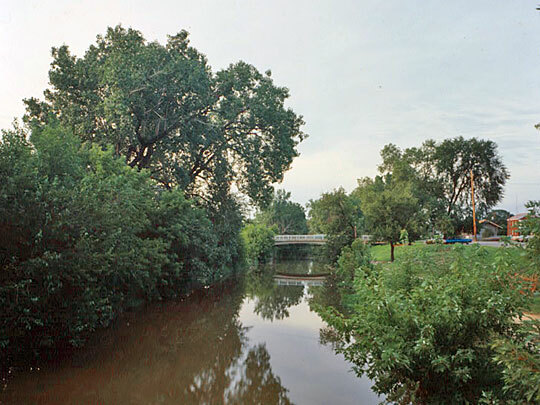 The canal's presence contributed to the growth of Lockport as a principal grain processing and commercial center. Water power to operate milling facilities and a paper factory was provided by a hydraulic basin situated on the west side of the canal in the vicinity of 13th Street. Commercial traffic on the canal decreased in the final decades of the nineteenth century, and ceased with the opening of the Chicago Sanitary and Ship Canal in 1900. Historic American Engineering Record, Lockport Historic District, Illinois & Michigan Canal, documentation, HAER IL-16-A, memory.loc.gov, accessed June, 2012.